One common scenario for applications is displaying a UI that is driven by event data. In this tutorial I’ll go over a very useful technique that I work with almost daily, which I learned from one of the incredibly talented engineers that taught me early on. The technique is for building multiple custom views that can be used in various layouts and updated by passing data to one container view per layout. All code for this tutorial can be found on GitHub. The first thing we need to do for this example is create an interface that will be used by all of our updateable views. This interface only has one method, update, which is used by our views in order to update their state. Now that we have our data models and interface set up, it’s time to start creating the updateable views for our project. To start, we’ll go over the standard child views, in this case modified TextViewand ImageViews, and then we’ll move on to the container view that triggers the state update in all of its child views. Our first example of an updateable view is WeatherImage, which simply implements our Updateable interface and extends ImageView. In the update method that comes from the Updateable interface, we check the Weather object for data pertaining to the weather condition, and then display an image based on that data. 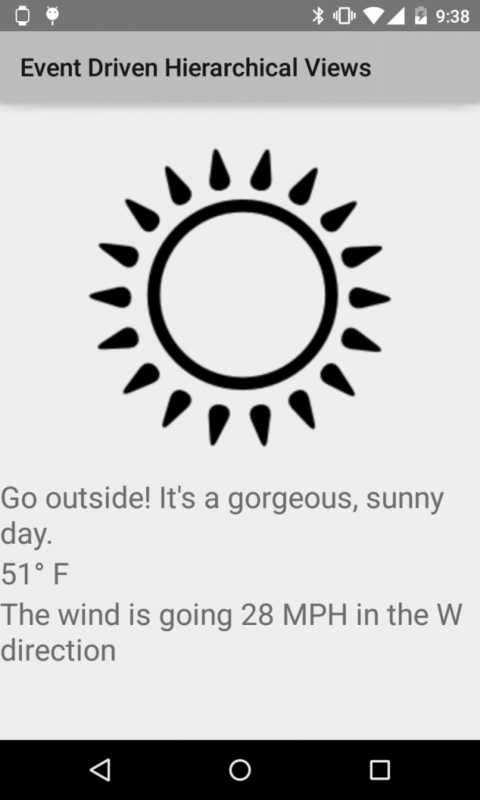 We use this technique for children views for WindWeatherTextView, WeatherTextView and WeatherTemperatureTextView as well, though instead of extending an ImageView, we extend a TextView, as the class names imply. Where the magic really happens is in the container view for these updateable child views, UpdateableLinearLayout. Our container view implements Updateable as well, however instead of adjusting itself during update, it calls update on all of its child views. These same methods could easily be used for a RelativeLayout class, or any other ViewGroupthat a developer would want to use for their event driven layout. As you can see, our UpdateableLinearLayout is our root ViewGroup for this layout, and all of its children are custom views that implement our Updateable interface. It is good to note that our UpdateableLinearLayout can support other children views that do not implement Updateable, though they will not automatically update when new data is present. For this example we implement this layout in our MainActivity and save a reference to the root UpdateableLinearLayout in onCreate. 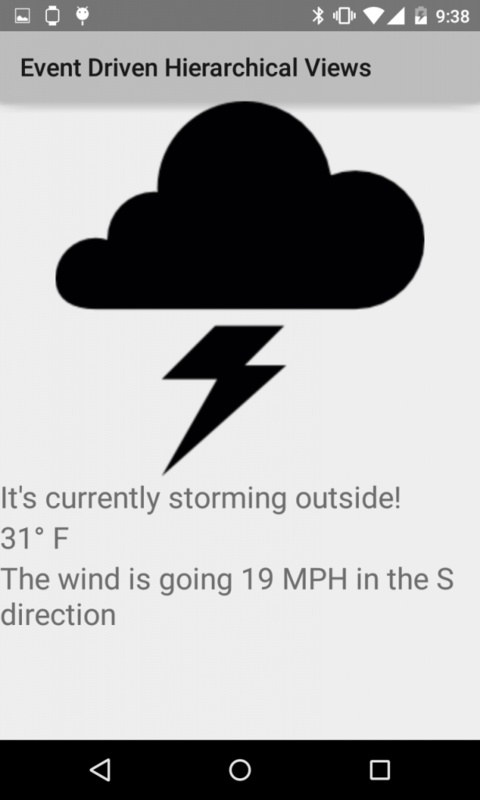 For this example, since we aren’t using a live API in order to drive our data, I have created a method that simply goes through random Weather data every three seconds and calls update on the root view in order to simulate fresh data changing our view. And with that we now have custom views that change how they are displayed based on updating data, and can be reused in multiple places across our app by simply building multiple layout files. This technique has been invaluable in my every day development, and I hope it’ll be useful for other Android developers as well.